They also adapt to average garden conditions. Just give them full sun and any well-drained soil. Moss roses don't need much care. Water them after planting and watch them go. They'll grow 4 to 8 inches high and spread 6 to 18 inches. You don't even have to deadhead. If plants get scraggly, you can cut them back. Don't fertilize too much; it will encourage plants to produce thick foliage but fewer flowers. Moss rose plants are widely available in the spring. They're also easy to start from seed. Start them directly outdoors around the last frost date. Rake the soil surface and sow the seeds without covering them. In areas with shorter growing seasons, you can start the seeds indoors 6 to 8 weeks before planting them outside. To minimize transplant shock, start the seeds in peat pots that can be planted directly into the ground. Portulacas will also self-sow in the garden, but not to the point of being a nuisance. They're much prettier than your average weeds. Plant them in a rock wall or along a sidewalk and they may show up next year in the cracks and crevices. Some of the hybrid cultivars don't come true, so expect smaller flowers and fewer colors from self-sown seeds. 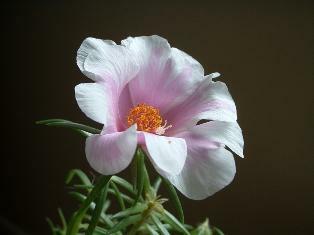 Portulaca grandiflora has been a popular garden flower since the late 1800s. The species has thick stems covered with succulent, needle-shaped leaves. Flowers are about 1 inch in diameter and can be single, semi-double, or double. They come in a wide range of bright colors including neon pink, red, orange, and yellow. More recent introductions include pastel shades such as apricot, cream, and white. Some plants have mottled, bicolor flowers. All portulacas need sun for their flowers to open. The flowers of older varieties closed up around noon. But most plants sold today have blooms that stay open all day. They stay closed at night and on cloudy days. Plants in the Sundial Series have gigantic, semi-double flowers up to 2½ inches across. The plants spread about a foot across, making them perfect for containers. 'Sundial Peach' has unusual peach flowers with darker centers. The Margartia Series is a compact, early flowering type that produces loads of 11/2-inch, semi-double flowers that appear ruffled. Margarita Rosita is an award-winning hot pink selection. The Tequila Series has a tendency to tolerate cool, wet conditions better than others. Spreading plants grow 2 inches tall by 14 to 18 inches across. Try Tequila Red, Tequila Orange, or Tequila Mix. Yubi Hybrids are often sold in pots or hanging baskets. They produce plump, paddle-shaped leaves and spectacular 1- to 1 ½- inch blooms. The exposed stamens at the centers of the flowers give them a two-toned color effect. Double Sunset Fire is an exciting new moss rose. One-inch, double flowers feature a vibrant combination of ruffled magenta centers backed by bright yellow/gold petals. Plants grow 2 to 4 inches high. Hot Shot is another popular series of plants, available in several colors including fuchsia, rose, mango, and orange. They grow between 4 to 6 inches tall. Portulacas look great planted in crevices of rock walls or on the edges of gravel paths. 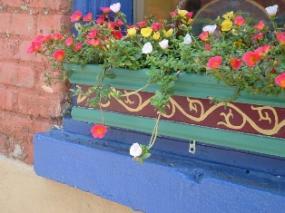 They also work well in containers and hanging baskets. Because they thrive in dry conditions, moss roses are a good choice for strawberry jars. Plant them in your rock or alpine gardens for season-long color. Plant masses of single colors of portulaca for dramatic impact. They make a great groundcover for hot, sunny areas. Purslane, Portulaca oleracea, is a noxious weed. Although it is sometimes sold as a vegetable, it should be avoided. If you are looking for a plant that's fairly low maintenance but produces an abundance of brightly colored blooms, portulaca is a good choice. Portulacas are forgiving plants that can tolerate a little neglect, which makes them perfect for any level of gardening expertise. When you weigh effort versus reward combined with their versatility, it's hard to find a better all-around choice in the annual family.